On political and on social issues, there are no objectively absolute rights or wrongs. Aspirations of minorities, unorthodox views, and individual claims should be afforded respect as a matter of equitable social order, fair and stable political arrangements, human rights. On matters of science there are some absolute wrongs. Regarding knowledge about how the natural world works, there are some claims and views that are absolutely, definitively, inescapably wrong — that objects tend to fall away from the Earth, or that the Earth is flat. There are also some matters that are, factually speaking, absolutely right — provided only that the natural world is as regular and law-abiding and non-capricious as very long experience suggests it is: the sun appears to travel from east to west; the earth’s shape is approximately spherical; and so on. Facts can be absolutely right — but not any particular interpretation of them at any given time. In science, minority opinions about the interpretation of facts should be attended to because they may be right, or at least more right than the prevailing majority or mainstream view. That’s what the long history of science teaches: the majority view, the scientific consensus, may be wrong at least to some degree at any given time. Unfortunately, this highly consequential fact is absent from most public discourse. It is a very little-appreciated reality that any given mainstream scientific theory is probably wrong in the longer run and thereby already misleading, to some degree or other, in the present. Few people indeed, and moreover few scientists, know anything of the actual history of science. History of science is not a standard part of the education and training of scientists. When there are gestures in the direction of history of science, what passes for it in the typical experience of most scientists is merely a chronology of significant advances in their specialty. The true history of science is quite a different matter. Its overriding insight, which should be mandatory information for all policy makers and politicians and pundits, is that significant advances, revolutionary breakthroughs, have frequently represented the overturning, repudiation, falsification of earlier mainstream theories. Science has progressed by rejecting mainstream dogmas that were defended bitterly to the very end by the leading scientific authorities, who had to be dethroned or outlived before the evidence was allowed its proper due. In the nice paraphrase of Planck’s dictum, science progresses funeral by funeral, by the deaths of earlier beliefs as their adherents pass on. This is standard knowledge only within such tiny academic sects as history, philosophy, and sociology of science and the umbrella field of science studies or science & technology studies (STS). The fact becomes known also through their personal experience to the rare, truly groundbreaking researchers who are astonished to find their discoveries shunned owing to mainstream “peer review” — Lauterbur, whose invention of magnetic resonance imaging was refused publication in Nature; Planck himself, of course; in recent medical science, Marshall and Warren who discovered the bacterial cause of many ulcers and were laughed at or ignored for a couple of decades before gaining a Nobel Prize; or Stanley Prusiner who was laughed at for about a decade for suggesting prions as cause of mad-cow disease, until the mainstream capitulated and awarded him too a Nobel Prize. There are innumerable other instances listed by Bernard Barber in his seminal article, “Resistance by scientists to scientific discovery” (Science, 134  596-602.). 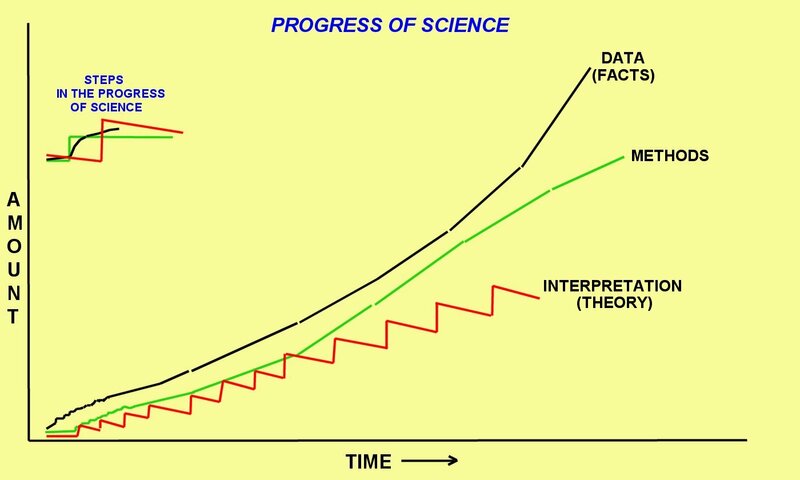 It’s a full half century since Barber published his data in one of science’s flagship journals, yet most science writers, journalists, and pundits remain ignorant of it. They imagine that the spokespeople for established scientific institutions are the most trustworthy source for opinions on controversial matters, and they imagine that science has progressed rather steadily as well as surely, and they imagine that significant advances were a systematic building on earlier knowledge. It’s also half a century since Thomas Kuhn pointed out that science had advanced anything but steadily, rather by a series of “scientific revolutions” that interrupt the normal routine of the rather uninspired scientific activity engaged in by most researchers, who try to solve intricate little puzzles without ever questioning the conventional wisdom. Kuhn unlike Barber is widely cited, but his work is grievously misunderstood: scientific revolutions are commonly taken to be giant strides ahead, when their real significance is that older views are overturned, rejected. Some of the greatest advances in scientific understanding have come from innovators who had a hard time opening the eyes of their Establishment peers to the evidence that the conventional theories were inadequate or even wrong; innovators like Arrhenius, Ampère, Faraday, Heaviside, Helmholtz, Lister, Mendel, Ohm, Pasteur, Karl Pearson. Revered in retrospect, they were not respected or believed by the contemporary scientific authorities. It is worth noting that several of these individuals had little or no prior status or prestige in the field in which they made their discoveries. That’s the true history of science, including the so-called modern science that got going a few centuries ago; and it remains very much true for contemporary science. The best scientific insight may be found nowadays in quarters that are of low status, of no prestige, outside the authoritative specialist pale. There is no more ground to believe what the National Academy of Sciences claims nowadays than there was ground a century ago to believe what Lord Kelvin claimed about the age of the earth, or to believe the scientific authorities of a century earlier who denied that meteorites could have fallen from the sky. Those authorities had some reasons on their side, and they had been right about many things, but they were quite wrong on some other things. Not all presently accredited claims are equally dubious, of course. Beliefs that are universally shared are likely to prove inadequate only at some fairly distant time. But when competent insider specialists question a mainstream belief, their arguments ought to be attended to, because that mainstream belief might be far along on the road toward its funeral. Of course not all minority views are later vindicated; many are called but few are chosen. There is no certainty that any given heterodoxy will become mainstream dogma at some time in the future. What is certain, though, is that any given contemporary mainstream belief will be found wanting to some degree and will be superseded; the question is not whether that will happen but only when and how it will happen, and to what degree it will be found wrong. How then is it rational to respond when a mainstream scientific creed is questioned by qualified, competent people? By examining the evidence. It’s only the evidence that matters and not what the authorities say about it. The difficulty is to make the evidence widely accessible, and to recognize that non-specialists can reach sensible judgments even about highly technical matters by observing the manner in which the mainstream responds to criticism (and also the typical lack of manners with which the mainstream responds to criticism). When the authorities don’t meet challenging arguments head-on and substantively, one may infer that perhaps they are not able to. When personal attacks are resorted to, one may infer that the substantive questions cannot be answered. That, of course, is the situation with HIV/AIDS dogma. Somehow it must become prominently known in public discourse that competent, knowledgeable people question HIV/AIDS theory on substantive factual grounds and that the lesson of history is that such mainstream dogmas have often been wrong in the past; the minority opinions of competent specialists often turned out to be correct. Typically, any new method allows the gathering of previously inaccessible data; and eventually those data show up the deficiencies of earlier theories and culminate in a fresh theoretical approach. Over time, a theoretical framework becomes less able to accommodate all the information that continues to come in, so the validity of a theory regresses from apparently universal, almost from the time it is adopted; inexplicable anomalies accumulate and eventually the theory is replaced. In most cases of disputes between mainstream and minority views, it is primarily the interpretation, the hypothesis, the theory that is being challenged, not all of science. Awareness of that might help outsiders be willing to give credence to minority views: it isn’t “science” that’s being disputed, just a particular interpretation of acknowledged data. This description is simplified though not misleading: the three aspects of science are not really independent variables. Philosophy of science has long pointed out that “facts are theory-laden”: our beliefs color the manner in which we “see” the data, we are not capable as humans to grasp data objectively. Methods are also theory-laden: our beliefs influence what we believe the methods do. In the case of dissent from HIV/AIDS theory, the fundamental challenge is to the hypothesis that “HIV” causes “AIDS”. But that hypothesis also influences what methods are (mis)used — “HIV” tests, CD4 counts, “viral load” by PCR — and how the obtained data are interpreted. For more detailed discussion of science as a troika of facts, methods, and theories, with particular attention to heterodox claims, see my books The Enigma of Loch Ness: Making Sense of a Mystery (1986, pp. 152-3); Science or Pseudoscience: Magnetic Healing, Psychic Phenomena, and Other Heterodoxies (2001, pp. 9-11); Fatal Attractions: The Troubles with Science (2001, p. 96 ff.). The salient point remains that scientific theories are not the same as accumulated factual scientific knowledge, and that questioning a theory is not the same as questioning “science”. An understanding of this and more generally an understanding of what science is and how it advances might help outsiders realize why minority views must be attended to even when the authorities dismiss them out of hand. It might be useful to point this out when critiquing HIV/AIDS theory. This entry was posted on 2011/07/05 at 10:52 am	and is filed under experts, HIV skepticism, prejudice, uncritical media. Tagged: history of science, resistance by scientists to scientific discovery, three aspects of science. You can follow any responses to this entry through the RSS 2.0 feed. You can leave a response, or trackback from your own site. Consider the classic Ptolemy > Copernicus > Newton > Einstein. They all explain why those spots of light “move around” in the sky. Even in the latest (Einstein) version, there remains the understanding from Newton that bodies exert influence on other bodies according to mathematical rules. And there remains the understanding from ancient Ptolemy that those spots in the sky are large distant objects moving around in approximately circles. Thus Ptolemy has not been dumped in the bin, rather his conceptualisation is the very foundation of modern space science. On the other hand hiv>aids WILL be dumped wholely in the bin because it is a pseudoscientific HOAX just like Lysenkoist michurism and so on. “the long history of science teaches: the majority view, the scientific consensus, may be wrong at least to some degree at any given time”. In the normal course of events, the mainstream view gets modified, expanded, fine tuned. It is with revolutionary changes, Kuhn’s instances, that the earlier views are discarded, e.g. quantum theory. The salient point, which is so missing from public discourse, is that the mainstream consensus MAY be misleading, and counter-evidence and -arguments offered by heterodox thinkers should be attended to. It is a dangerous mistake to brush things aside just because the “scientific consensus” is otherwise.